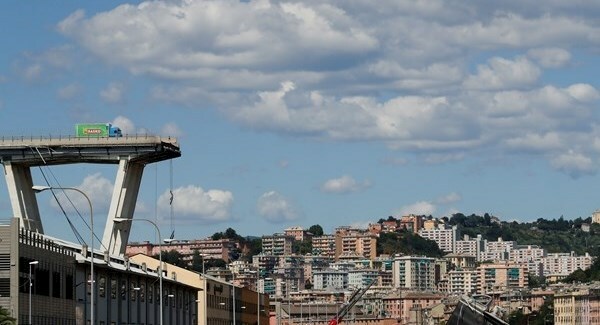 Genoa: one off or more to come? The Genoa bridge disaster will be the first of many such incidents unless government policies and priorities change. That is not to say there will be further such dramatic catastrophes but there is likely to be a steady stream of more minor incidents, such as rockfalls, tunnel closures and urgent bridge repairs. This is a consequence of the failure by governments across the world to prioritise the maintenance of ageing assets. This was a disaster waiting to happen given the state of Italian roads. I have just driven down the E45, part of a European route linking Norway with Italy, between Cesena and Perugia, and there were at least ten sections where there were diversions for repairs. Indeed, I have driven along this road, which cuts through the Apennines in a series of tunnels and bridges, dozens of times in the past 20 years and there has never been a single journey where repairs are not taking place, but they never seem to permanently fix the problem. The poor state of roads is by no means confined to Italy. In France, Le Monde reported on the Friday after the disaster that a third of bridges across the French road network need repairing and that a very worrying 7 per cent ‘are at risk of crumbling’. Le Monde blamed years of underinvestment and a failure by politicians to recognise the need for increased spending. The figures in the US are even more stark. The interstate highway network, built between the 1950s and 1970s on the initiative of the former General, President Dwight Eisenhower who was obsessed with the military imperative of having efficient highways. It was, in fact one of the biggest stimuli for the American economy and has returned more than $6 in economic development for every $1 invested. Yet, despite the occasional bridge collapse and many road closures for repairs, there is no clear agreement on who will fund the much needed repair bill. The Interstates are currently paid for by a tax on fuel but politicians, both local and federal, have been reluctant to increase the tariff which has remained unchanged for decades. Consequently, with cars becoming more fuel efficient and some drivers now using electric vehicles, the amount available from the tax is declining in relation to the growing need. President Trump has promised $1trillion to address the problem though it is unclear either where the money is coming from or how it will be allocated. This state of disrepair of the roads worldwide is a result of three factors. First, the constant drip drip of cuts to government budgets in the name of austerity across Europe and indeed many other parts of the world have hit the transport sector particularly hard. Maintaining roads is a boring, humdrum task that is low on the priority list of the organisations in charge of them. Moreover, because so many different players amid numerous layers of government – federal, regional, local, even parish – are involved, there is a tendency to pass the buck and blame a different government agency when potholes need to be filled or bridges checked. There is never a sole agency responsible for roads across a particular country and that means there is a lack of political will to solve the problem once and for all. Secondly, even when there is money available for the transport sector, it is often spent on far more ‘exciting’ projects than maintenance. A new bridge, railway line or motorway will involve ribbons being cut, praise for politicians and a general sense of excitement. Repairing a crumbling bit of road attracts none of these. There politicians find shaving a few million euros or dollars off maintenance budget is far easier than scrapping an exciting new facility. There is, too, the fact that road accidents are rarely newsworthy. Many deaths on the roads are caused by potholes or poor surfaces, and yet these attract little attention. The Genoese disaster was rare in terms of its scale whereas in contrast accidents in aviation and railways are generally spectacular and have heavy death toll. This strengthens the hand of the people running those industries to press for increased safety, even if it is expensive. For example, across Europe signalling systems are being modernised to reduce the need for drivers to see them and while this is very expensive, few question the need for such a radical change despite the comparative rarity of rail accidents. Then, thirdly, the need is now much more urgent. The postwar construction boom in the 1960s and 1970s means that many of the motorways and bridges are now reaching the end of their useful life with the stark choice facing many government agencies of either spending massive amounts on renewal or creating an entirely new structure. The economic zeitgeist has changed. At the time the prevalent model was Keynesian with an acceptance that such schemes would create jobs and have economic effects that filtered through the economy. Neoliberalism, the prevailing ethic today, is only concerned with limiting government spending. Genoa must be a wake up call across Europe and indeed the world. It must lead to a reassessment of the way that government spending is prioritised and, in particular, how the lack of maintenance of long term assets is fast reaching crisis point. There is, though, an even wider consideration This disaster should be put in the wider context of road safety which kills an average of 3,300 daily worldwide or 1.3m annually. That toll is accepted as the cost of mobility but increasingly governments are seeing it as unacceptable. Improving the road infrastructure is not just about making bridges safe and filling in potholes. There should be a whole rethink about the way we have allowed road transport to become the major killer of people across the world who have not reached old age. Let’s hope the lessons of Genoa are learnt across the transport sector.